I was looking around the internet for a new recipe. Slow Cooker recipes are a favorite - perfect for those weekdays while I am at work. Believe it or not, I have been cooking healthier lately.... or eating healthier. I still make favorites for the Chris and the girls. 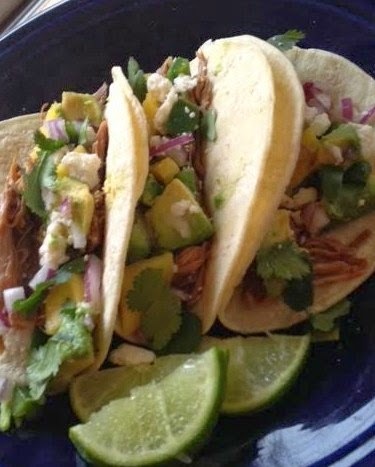 I made these Slow Cooker Pork Tacos last week when Annie and Jenna were back from Baylor. We LOVED them. They had a great flavor. We ate some with mango salsa, some with purple onion, cilantro, avocado and Cotija cheese. Annie and I loved ours with lime. YUM! All varieties were great. At first, I couldn't find the Cotija cheese and searched the internet for a substitute. If I wanted the aged flavor, go for parmesan but if I wanted the texture, go for feta. I finally found it in the store. I am so glad I did - great texture and flavor and perfect for these tacos and other Mexican dishes. AND - I made my sauce the night before so I could throw it in the slow cooker quickly the next morning. I found this recipe on the Food Network. It got 5 stars and 182 reviews. I loved reading the reviews and how people varied their recipes. Put chiles and garlic in a bowl - add 2 -3 Tbsp water and microwave on high until soft and pliable - 2-3 minutes. Stem and seed the chiles and peel the garlic. Transfer chiles and garlic to a blender. Add chipotles, onion, 2 Tbsp olive oil, honey, vinegar, 1 Tbsp salt and the oregano in blender - puree til smooth. Heat the remaining tablespoon of oil in skillet over medium - high heat - add the chile sauce and fry, stirring, until thick and fragrant. Pour in the broth and reduce until slightly thickened. Season the pork with salt and pepper and transfer to a large slow cooker. Add bay leaves and cinnamon stick. Cover and cook until meat is tender. I cooked it all day on low. Discard bay leaves and cinnamon stick, shred the pork with two forks, season with salt and pepper if needed. Serve in warm corn tortillas with toppings.